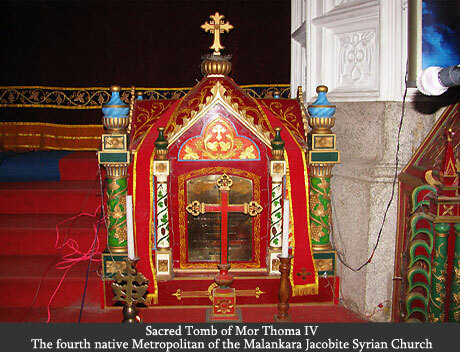 Metropolitan from 1688 to 1728 A.D.
Mor Thoma-IV was the 4th native bishop of the Malankara Jacobite Syrian Church, ordained after the historic 'Koonen Kurissu pledge' of the 17th century. He was consecrated Metropolitan by the Patriarchal representative Mor Ivanios Hidayatulla (who came to India along with St. Baselios Yeldho Maphriyono) in 1688. For more than four decades, Mor Thoma IV led the Malankara Church. 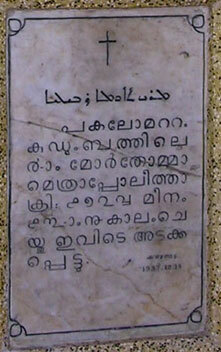 He belonged to the famous Pakalomattom family which headed the Malankara Syrian Christian community for centuries. His immediate predecessor was Mor Thoma III, who also got ordained by Mor Ivanios the Patriarchal representative. Mor Thoma III passed away about an year after his Metropolitan consecration, on 19th April 1688, and was entombed at the Kadambanad Church in south Kerala. Mor Thoma IV is recorded in the history as a pious and able Metropolitan, but unfortunately a major part of the 40 years of his service had spend for defending the Syrians against a Nestorian bishop Mar Gabriel, who had been send to Malabar in 1708 by the Nestorian Patriarch to bring the Syrians into the Nestorian faith. Mar Gabriel was always a trouble shooter, even for the Nestorian church that send him; Immediately after his arrival in Malabar he entered into an agreement with the Roman Catholic Bishop at Changanacherry to join that Church. But shortly after, when his Nestorianism leaked out, information was received from Rome that he was a vowed Nestorian heretic. The wily bishop next approached Mor Thoma IV and after long discussions for weeks, signed the Profession of faith. But again his Nestorianism surfaced and consequently he was expelled by Mor Thoma IV himself, at Kandanad. 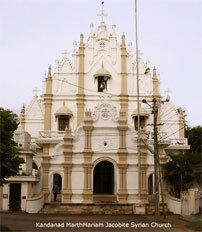 Mar Gabriel later went to Kottayam and gained the co-operation of certain priests who were not in good terms with Mor Thoma. Thus he tried to promote disobedience in the Syrian Church. There is a story concerning him that, a Syrian Christian discontented with Mor Thoma, hearing of Mor Gabriel’s arrival at Cochin, paid a visit to him and on his return, referred to him in words which have since become a proverb, viz., that he was “neither a father nor an uncle, but fit for the present purpose” (of opposing Mor Thoma). Mor Thoma IV wrote to the Dutch Governor at Cochin, complaining against Mor Gabriel’s intrusion and soliciting the Commodore’s help to oust him from diocese. He opposed Mar Gabriel as long as he lived. In the hour of his distress, Mor Thoma sent piteous appeals for help to the supreme pontiff of the Church, the Patriarch of Antioch, which is mentioned in the Travancore State Manual. The full text of one of the two letters written by Mor Thoma IV and addressed to the Patriarch, is given below. To my Lord Ignatius, Patriarch of Antioch I, the poor Mar Thomas, the fifth bishop of the Syrians of India, write and send. In the name of Him who is eternal and of necessity exists: from Thomas the humble, Bishop of the Orthodox Syrians of the India of St. Thomas: to him who sits in the seat of the Pontiff, holy and glorious and magnificent, upon the throne of the principality of Peter, the Prince of the Apostles; whom Our Lord has called by his grace, and by his mercy has collected and firmly made to sit. Most beloved Father of Fathers and Pastor of Pastors, who bindest and loosest with thy power in the highest and in the lowest, holy, and holily sanctifying, and resplendent with the triumph of the Apostles; who rulest upon the glorious soild of Antioch, which is celebrated and lovely through all the four quarters of the world and in the world to come. Amen. Because thou art Patriarch, the head of the Universal Church of Christ, as was ordered by the three hundred and eighteen Fathers who were assembled at Nicea, and the steward of the house of God obtaining the whole order of the Apostolic Church; and for as much as thou dost worthily govern the sheep which are in the Oriental flock, always introducing all the sheep of thy flock into the fold by the gate, and when, of all, one perishes, thou dost vehemently grieve, but when thou dost see it again, thou dost greatly rejoice. Our Father, who wast elect in the abundant blessings of Sion, therefore, I wish thee to be as a vessel chosen to receive the grace of the most high God. I beseech, my Lord, that thou mayest bless me with thy right hand full of grace, and I shall hear whatever may be said or enjoined to me by thy benign mouth, and I subject myself to the power of they paternity, wherefore may God bless thy See for ever and ever. Amen. My Lord, I am not worthy to worthily write to thy greatness. But we write and we send letters because of the necessities of the Orthodox Syrians of India, and we pray that thou mayest send to us one Patriarch and one Metropolitan and twin priests, who may be philosophers and may understand the interpretation of the holy and divine scriptures. Previously there came to our country Mor Gregory, the fifth Patriarch of Jerusalem, and after him Mor Andrews Alveus, and after him came a certain Maphrian Mor Basil Catholicos, and with him Mar John the Metropolitan, and the Rabban Mathews. Since their death, we drift like a ship without a rudder. If thou wilt come to aid us, as God the Father promised to the sons of Israel, so may Jesus Christ, the Merciful and the Ruler, deal with you, and so may the Holy Spirit, the Paraclete, console you. Amen. In the year of our Lord 1709, there came a Metropolitan, by name Gabriel, the Ninivite, whom Mar Elias Catholicos sent to me. But he held such a faith as that Christ had two natures and persons; and therefore we did not believe him, except a certain priest called Mathew Beticutel and a few Portuguese Roman Catholics. We, however, have not wisdom that we may answer him. Therefore, we report it to thee, our Lord. Charles, a Dutch Doctor, an Orientalist of repute, a learned man and a proved philosopher, our dearest and most beloved companion, dwells in Amsterdam, the first city of Holland. He has addressed us that we may proceed in this matter with one mind. We have written to him in order that this matter may be made known to Antioch; that you through the mercy of God may write one letter to the honourable Commandant who dwells in Cochin, which town is subject to the King of all India, and another letter to us; that it may bring help to us against our enemies and the infidel kings for ever; and that above all, you will with the utmost care supplicate King Comphocius, who greatly honours the Dutch and is very illustrious among kings. This king gives judgement in accordance with equity and receives the petitions of the poor and greatly honours all this nation, and all these honour Antioch and despise Rome; and they are right. Amen. My Lord brilliant Ignatius, take action without delay and diligently look after all this business, forgetting no part of it, through the living God. Amen. Especially pray in order that we may obtain a blessing by your prayers. Pray to the beloved Father and the merciful Christ and the Holy Spirit, the Protector, and the Virgin Mary, Mother of God, and the Saints. Amen. In the year of the epoch of our Lord 1720, this epistle is written from Pharabur Patona (Pattamana Paravoor), a church of St. Thomas the blessed Apostle, on the 25th day of the month Elul (September). Amen. Our Father etc. The Gate of all India. In the above letter, dated 1720, (a copy of which may be seen in Asseman, IV, 466), the Patriarch is designated the Supreme head of the "Universal" Church of Christ by the appointment of three hundred and eighteen Fathers of Nicea; reference is made to the former Antoichean bishops, St. Gregorios Abdul 'Jaleel , St. Baselios Yeldho Maphriyono, and also Mor Ivanios, whose death, it is said, reduced the Malabar Church to state of a ship without a rudder; Mar Gabriel is alluded to as a Nestorian who taught that Christ had two natures and two persons, and who consequently was not recognized except by a single priest; and the Patriarch is requested to send bishops and priests well versed in philosophy and in the interpretation of Holy scriptures, as well as to write letters to the Dutch Commander at Cochin soliciting his help to the Bishop against his enemies and against infidel kings. Unfortunately this letter did not reach its destination, but somehow escaped to Europe and was published there. Asseman, who saw it, or perhaps a copy of it, concludes from its terms that the writer was a Jacobite who depended upon the See of Antioch. How strong was the relationship between the Holy See of Antioch and the Malankara Syrian Church is proved beyond doubt by these evidences. In 1728 Mor Thoma IV became seriously ill when he was at Mulanthuruthy. This was at a time when Mar Gabriel who was trying to carve out a position for himself in the Syrian Church was still active in Malankara. Therefore the local leaders of the church brought the seriously ill Mor Thoma IV to Kandanad and laid his hands on Fr. Thoma the nephew of Mor Thoma IV, thus consecrating his successor with the title 'Mor Thoma V'. This said consecration became a matter of great controversy in the Malankara Syrian Church because of the allegation that it was done by Mor Thoma IV who was actually unconscious at that time. History says that even Mor Thoma V was not himself satisfied with the manner in which he was consecrated and hence applied to the Patriarch for delegates to confirm his status. Mor Thoma IV breathed his last, two hours after this said consecration of his successor on 24th March, 1728 (M.E.- Meenam 13, 903). 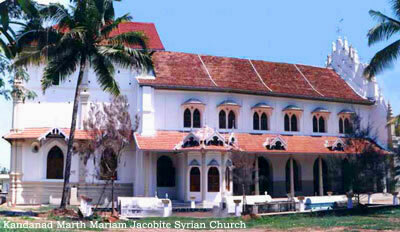 The mortal remains of the holy father were interred at the Marth Mariam Jacobite Syrian Church at Kandanad the next day. mortal remains of Mor Thoma IV and Maphriyono Mor Baselios Shakralla, rests.